Today we are highlighting the stamp set In My Heart. 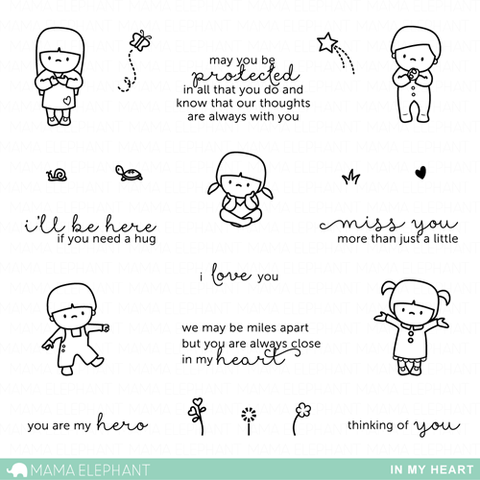 It was only a few months ago when Sandy Allnock placed an order with Mama Elephant and that was when I learned all about Operation Write Home and their mission. I was truly amazed how inspirational and giving this crafting industry is and we are super happy to be able to support such a wonderful organization with our art and some fundraising! We will be donating 20% of retail profits from our In My Heart Stamp Set sales to Operation Write Home from June 15th to July 31st. We encourage you to read more about Operation Write Home and how you can help. Let's take a look at all the wonderful cards our fabulous Design Team and Guest Designers have done. Elena created the perfect little scene! The little butterfly flying out of the sentiment is a sweet touch. 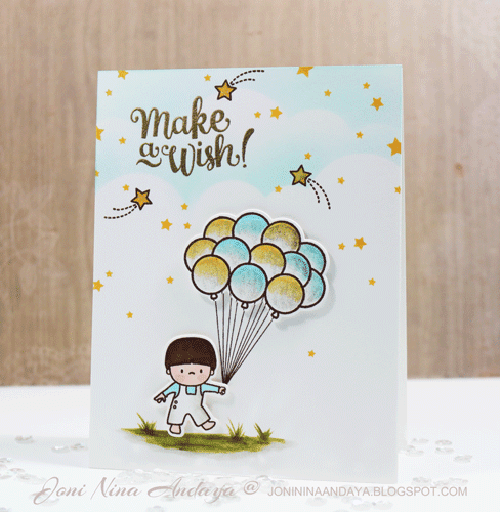 Joni combined the stars from Make a Wish with the stars from In My Heart and added balloons from Up and Away to make this sweet card. 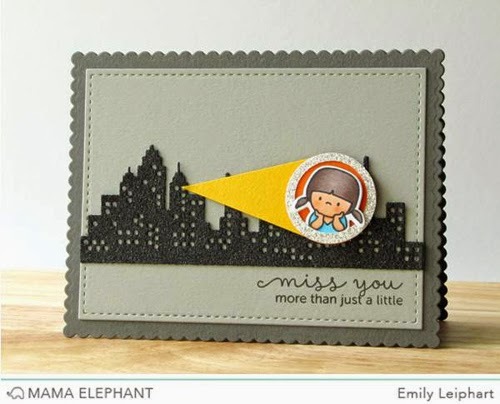 Emily magnified a window in Cityscape Creative Cuts to create a sweet scene of a little girl missing a loved one. 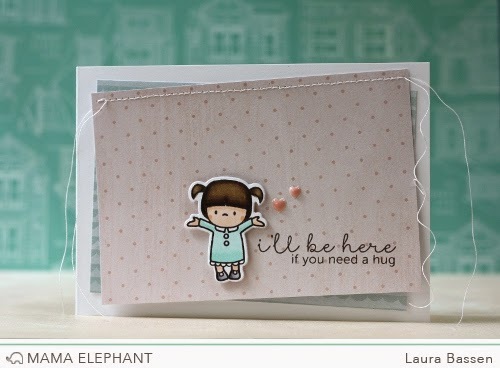 Laura created a cute little encouragement card using the stamps and coordinating dies. Sandy created this sweet card with cheerful and cute patterned paper. Nichol used the Starburst Cover painted with watercolors to create a soft background for the sweet copic colored girl and greeting from the In My Heart Stamp Set. A scattering of star confetti and rolling hills die cut using the Landscape Trio dies and painted with watercolors finish this sweet card. Aww...these are all so sweet! Love! This stamp set really warms my heart! Gorgeous DT samples! Such a great stamp set!! 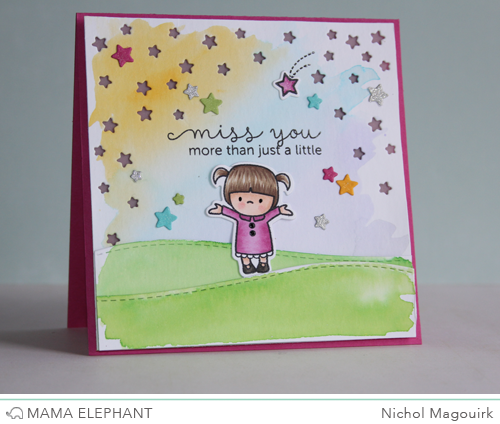 Really love the sentiment "Miss you more than just a little". The Design Team is filled with such talented ladies!! I especially love Emily's magnified window!! So clever!! Love all the beautiful cards! This set is adorable and perfect for OWH cards. Thank you Mama Elephant for joining in to help OWH. Oh my word, all of these cards are perfect! I love the card with the little girl looking out the window. This stamp set was showcased fabulously! this stamps are so cute, I love it! Honestly, you have the best DT ever. Of course, it doesn't hurt that this IS the sweetest stamp set ever. Had to have and now it's winging its way to me. All the cards are adorable! This is an awesome stamp set. 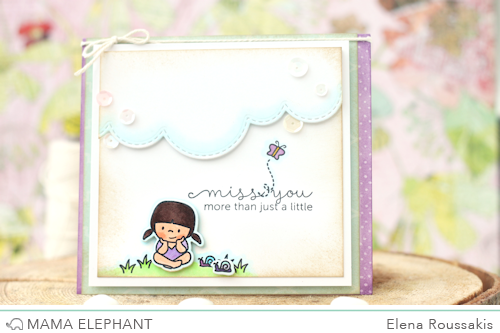 This is such a sweet stamp set...I Love all the really cute cards from the DT, too! What a darling stamp set! All the cards are soooo sweet! OMG, another stamp set I need to get! Love all the cards!! That little girl is just simply amazing she looks wonderful on all those cards!! Great stamp set. Love the little girl with the x-ray vision - looking out the window of her high-rise. All of the stars really add to the cards. they are all so cute. thanks for sharing. Oh my gosh I love these little people. So so adorable! These are awesome! I am loving the spotlight of the girl in Emily's card and how Elena added the sweet smile on her card. Every one is adorable! These images are so sweet. Love the smile on Elena's card! This is such a sweet stamp set, and the spotlight cards are terrific. I am definitely CASEing Emily's idea! Fabulous! All the cards are so adorable and creative! This set is super awesome! I love this sweet stamp set & all of the adorable cards! You guys rocked it! Awesome cards with this adorable set! Really cool designs. The stamp set is gorgeous. What a sweet set and what adorable cards! Love these stamps! I just got them & can't wait to start creating!